Fisherman Bats. Photo by Gerald and Buff Corsi, © 2002 California Academy of Sciences. 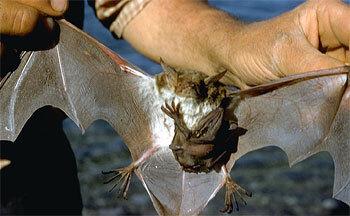 Small and furry, bats are the only mammals to have achieved powered flight. Their arms are spindly, with membranes stretched between the fingers on each hand. This arrangement makes their wings quite different from those of birds and pterosaurs, and in fact the bats have evolved flight quite independently. Bats also differ from other flying animals in their reliance on hearing for navigation. Many bats use sonar echos to find their way around. Despite their resemblance to rodents, bats are not closely related to mice at all. Though their exact placement is still uncertain, there is recent evidence that they may be more closely related to the primates. Whatever their relationships, bats are among the most successful groups of mammals: there are nearly 1,000 species of bats around the world, making up about one quarter of all mammal species. Click on the buttons below to learn more about the Chiroptera. Want to learn more about flight? What do a pterosaur, a bat, and a bird have in common? How do we know they evolved flight independently? Find out for yourself! To learn much more about bats  from their scientific names to how to keep them out of your belfry  visit the informative Bat Conservation International site.